KUALA LUMPUR (Sept 19): The FBM KLCI tracked global markets’ positive performances today after languishing in the red for the first half of the week, as investors returned after Bank Negara Malaysia and the US Federal Reserve held interest rates, and China eased banking liquidity to boost its economy. 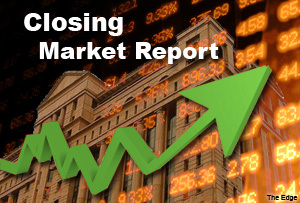 At 5:00 pm market close, the local benchmark index gained 4.17 points or 0.23% to 1,849.49 points. The KLCI exhibited volatile trade in early session, hitting a low of 1,843.35 points. It climbed back into the positive territory for the most part of the day, thanks to gains in blue chips including Felda Global Ventures Holdings Bhd, Hong Leong Financial Group Bhd (HLFG), RHB Capital Bhd, and IHH Healthcare Bhd. Astro Malaysia Holdings Bhd, which announced a 39% jump in its net profit for the second quarter ending Jan 31, 2015 (2QFY15), was also one of the KLCI’s biggest movers today. Lee Cherng Wee, senior analyst for JF Apex Securities Bhd, told theedgemalaysia.com that positive news coming from central banks had led to positive sentiment in the market. Yesterday, the US Federal Reserve’s Chairperson Janet L Yellen said that the interest rates would remain, as employment issues still lingered in the country. Bank Negara Malaysia also retained the Overnight Policy Rate (OPR) at 3.25% after the Monetary Policy Committee meeting yesterday. “It is good news for the local market (to have the OPR maintained). Financing costs will remain,” said Lee. Meanwhile, Lee added that speculation of the People’s Bank of China injecting 500 billion yuan into the economy also spurred positive sentiment among investors. On the broader market, Bursa Malaysia saw a total of 2.6 billion shares valued at RM2.26 billion traded. Gainers more than doubled decliners at 578 and 251 respectively. A total 320 counters were traded flat. Efficien E-Solutions Bhd was the most active stock today, followed by Sanichi Technology Bhd and PDZ Holdings Bhd. The biggest gainers were British American Tobacco (Malaysia) Bhd, HLFG and Fraser & Neave Holdings Bhd. On the other side, Aeon Credit Service (M) Bhd was the day’s biggest decliner. Most regional indices fared higher today. Japan’s Nikkei 225 gained 1.58%, Hong Kong’s Hang Seng Index was up by 0.57%, China’s Shanghai Stock Exchange Composite Index inched up by 0.58%, Korea’s Kospi Index added 0.3% and Singapore’s Straits Times Index was also up by 0.3%. Meanwhile, Reuters reported British markets rallied and the rest of Europe followed suit on Friday as Scotland's decision to stay in the United Kingdom eased investors concern amid a recent run of global political obstacles.